Next year, Peace Boat will celebrate its 35th anniversary. 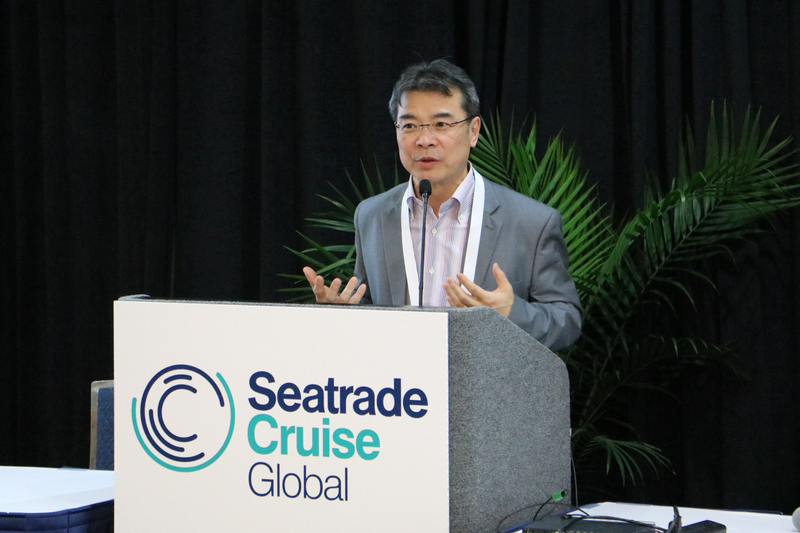 To coincide with this achievement, Japan’s largest cruise organization announced its 100th cruise at Seatrade Cruise Global, in Fort Lauderdale on March 15, 2017. The around the world voyage will sail from Yokohama, Japan on December 26, 2018 and will circumnavigate the planet in 96 days, cruising around the Southern Hemisphere and calling at 18 ports including Ehoala in Madagascar; Walvis Bay in Namibia and Rapa Nui (Easter Island). The organization, the only Asian cruise line specializing in affordable around-the-globe cruises, offers unique voyages that combine lifelong-learning programs and sustainable tourism. Peace Boat group is also working on what will be its most ambitious project to date, Ecoship, the most ecological cruise ship in the world, ready to sail in 2020. “In Peace Boat’s history there have been key moments of expansion. From our first regional voyage 100 people in 1983, to our present operations on a 1500 capacity vessel, going around the world three times a year, there have been several significant changes over the years which have shaped Peace Boat into the organization it is today”, said Yoshioka Tatsuya, Peace Boat’s founder and director. From its origins as a grassroots group working on East Asian regional friendship, Peace Boat has grown into a flourishing social business that embraces traditional cruise elements while continuously focusing on being socially engaged. Their work for the promotion of peace and sustainability has been recognized at many levels including a Nobel Peace Prize nomination in 2008. To date, Peace Boat has sailed over 60 world and 30 regional cruises, visiting over 100 countries. Over the years the organization has chartered several cruise ships that have increased in capacity – and complexity – to respond to its growth. “We have an extended network in the cruising industry and enjoy an excellent reputation. More than 60,000 participants have travelled around the world with us. Peace Boat’s current ship, Ocean Dream, is nowadays nearly fully booked”, explained Yoshioka. After three decades of operations with almost all Japanese passengers, Peace Boat is currently expanding into other Asian markets. From 2016, multitudes of passengers from China, Korea, and Singapore are joining Peace Boat’s world voyages and this February saw a lively Chinese New Year celebration onboard as Ocean Dream sailed towards Antarctica. This trend will continue in the next years with the projected boom in the Asian market, especially in China. 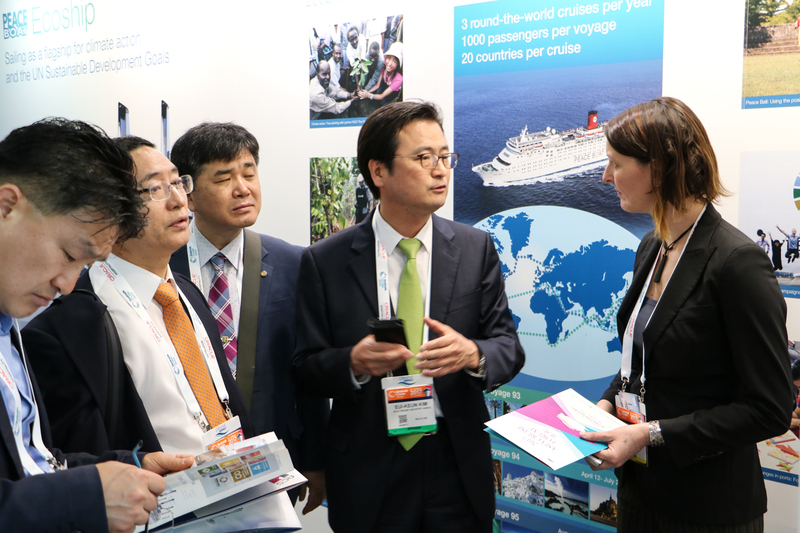 “We are very excited to see more nationalities enjoying Peace Boat voyages, and the opportunities offered for education, international friendship and voluntary activities”, said Yoshioka. With further expansion and more passengers onboard, comes responsibility. The development into the Asia market, makes Peace Boat’s work towards solutions towards climate change and sea protection even more important. Peace Boat has been working since 2013 on its project to build the world’s greenest cruise ship, Ecoship. Expected to sail in 2020, its launch will coincide with the Tokyo Olympics. Ecoship, a 60,000 ton vessel, will be a flagship for climate action and address the issue of carbon emissions in maritime transport while seeking to prevent ocean and coastal area degradation. By integrating a set of innovative technological and managerial solutions, Ecoship will be a showcase for what the industry can do. 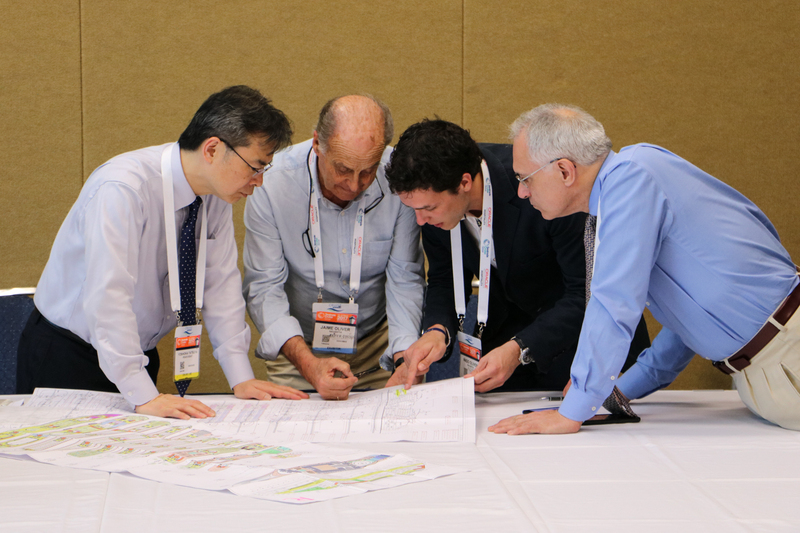 Its 3-4 annual world cruises, besides offering a state-of-the-art passenger experience, will create the framework for hundreds of educational programs, advocacy campaigns and applied research, as well as for the hosting of international conferences and world-class exhibitions on green technologies and climate action. 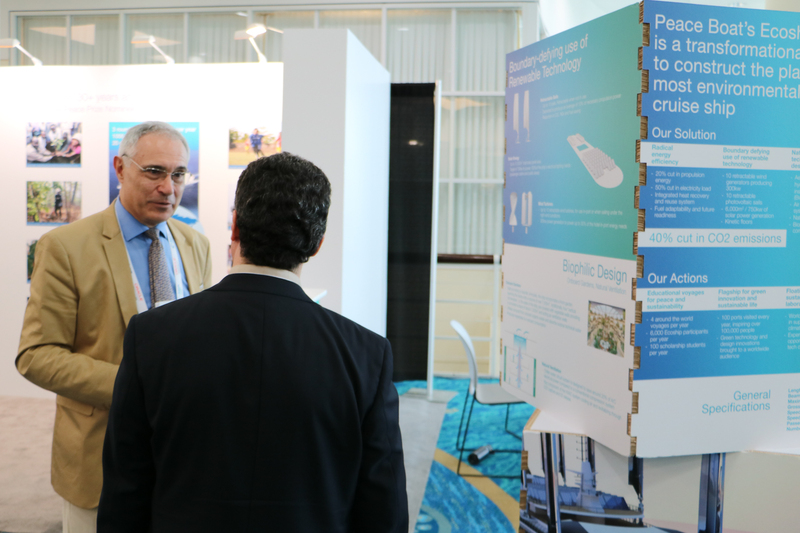 According to Andrés Molina, the Project Manager of the Ecoship, “the induced high-end technology and practical design will make it possible for the ship to achieve a reduction in CO2 of more than 40% compared with similar cruise ships”. 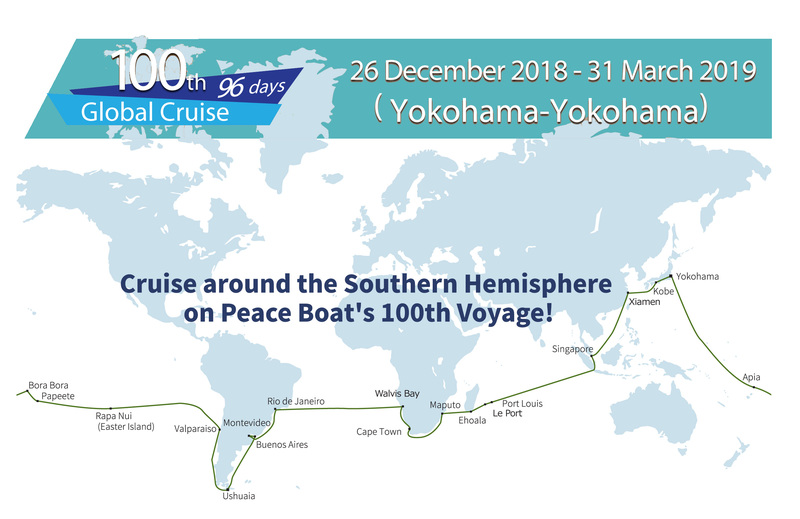 Throughout its history, Peace Boat has supported several UN-led campaigns and is now a committed campaigner for the United Nations Sustainable Development Goals (SDGs), working to inspire passengers, civil society and governments in each country it visits during its voyages to engage in reaching these goals. As part of this collaboration with the UN, the official SDG “Global Goals” logo was added on the side of the current ship in summer 2016. Peace Boat is also actively engaged in the UN-led initiative for the protection of the oceans and was the first organization to make a voluntary commitment for ocean protection as part of this process, with its Ecoship plans.